Redesigned in 2011, the Bates website has won top honors in a 2012 competition sponsored by eduStyle, a leading website for higher education Web design professionals. The competition, featuring both judged and People’s Choice awards in each category, saw Bates win both awards for Best Overall Website, and the popular award for Best Home Page. The winners were announced at the eduWEB Conference on July 31 in Boston. 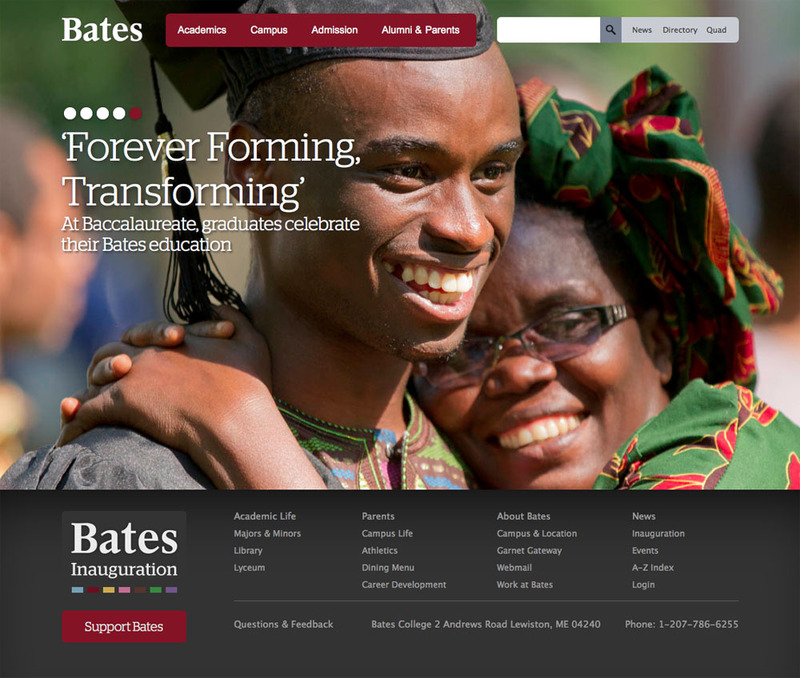 Redesigned in 2011, the Bates website took home top honors in the 2012 eduStyle Awards. The firm Tellart provited information architecture and strategy, then the Bates Communications webteam developed its look and feel, working in tandem with the college’s Information and Library Services’ systems and development team. In terms of its content management system, the site is driven 100 percent by WordPress. Having a unified, site-wide CMS is “what leads to a consistent user experience,” Wright-Magoon says. Webteam member Nicholas O’Brien says the site is especially effective in three areas. The 170-plus Bates websites hosted by the WordPress content management system all share a single design layout. “As users navigate across multiple sites, essential elements like the global navigation and site-specific navigation are always in the same place, and always behaving identically,” O’Brien says. The WordPress-driven site yields bountiful analytics. “That, combined with data from phone calls, emails, and face-to-face questions, gives us an accurate picture of what our users would like to know and how well the website is helping them find that information,” O’Brien says.